Ford shares have dropped nearly 40 percent since Fields took over as CEO in July 2014. WASHINGTON/DETROIT -- Investors on Tuesday shrugged off media reports that Ford Motor Co will announce plans to cut thousands of white-collar workers, highlighting the challenges facing CEO Mark Fields. 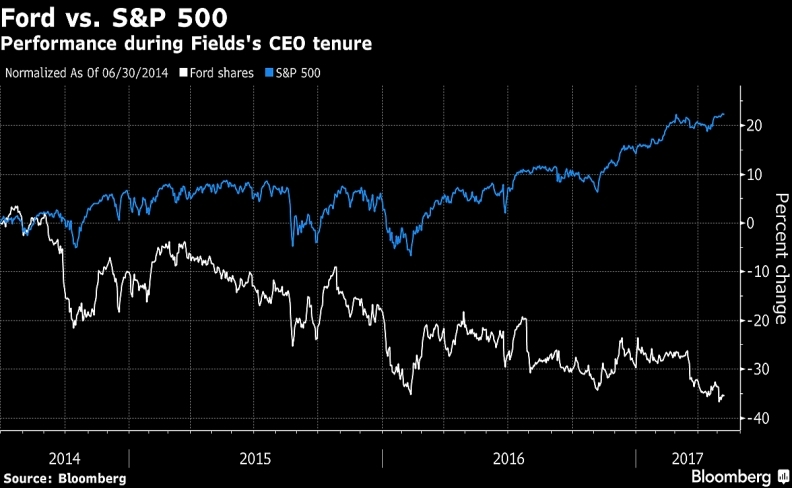 Fields, whose nearly three years at the helm have been marked by a languishing share price, is expected to announce as early as this week Ford plans to cut about 10 percent of its salaried workforce in North America and Asia. Ford does not plan any cuts to its hourly workforce or production capacity, people familiar with the company's plan said. Ford plans to offer financial incentives to convince salaried employees to depart voluntarily, including generous early retirement offers, a person briefed on the plan said. In 2016, Ford cut hundreds of white-collar jobs in Europe to cut costs by $200 million annually. Ford shares were unchanged on Tuesday, closing the day at $10.94. The shares are down nearly 40 percent since Fields took over as CEO in July 2014. The focus of the cost-cutting effort is on North America and Asia, people familiar with the plans said. Ford has about 30,000 salaried U.S. employees, a company spokesman said. Ford declined to confirm or deny the planned cuts, but said it was working toward "reducing costs and becoming as lean and efficient as possible... We have not announced any new people efficiency actions." The Detroit automakers are under pressure from President Donald Trump to add U.S. jobs, but declining U.S. sales and stalled share values are exerting a stronger force. Ford said in January it was cancelling a planned Mexico plant and adding 700 jobs in Michigan. Ford said last month it plans to cut costs by $3 billion in 2017, despite commodity prices rising by $1 billion. On Friday, Fields held an investor lunch in Boston. UBS analyst Colin Langan said in a research note that it remains "bullish" on Ford, noting its stock is priced at seven times earnings per share, lower than the long term average of 9 times earnings. "Fields was extremely candid about the market challenges including slowing U.S. sales, pricing pressure and rising commodities," UBS said in a research note Monday. U.S. automakers are trimming costs as they brace for slowing auto sales. General Motors has cut more than 4,000 U.S. jobs since November, and moved to conserve capital by shedding its European operations and closing unprofitable operations in Asia.